Calling all brides & their maids! These bridesmaid essentials are perfect for gifting and to wear on wedding day! 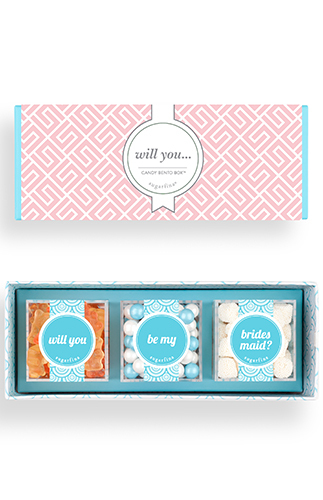 We are giving away the necessities for your bridal party – or you and your fellow bridesmaids. Tell us about your upcoming wedding in the comments below and win this pack of goodies for your gals. You’re the bridesmaid? Perfect! Enter to win for yourself and the ladies you will be standing up with! Take a peek at these gorgeous bridesmaid gowns while you’re at it :). 2. Nestina Accessories makes absolutely stunning bridal accessories! And your maids shouldn’t be left out! We’re giving away gold headbands for your girls to wear to add a little sparkle to their look! 3. Speaking of sparkle, jewelry is always a great gift for your bridesmaids on wedding day. 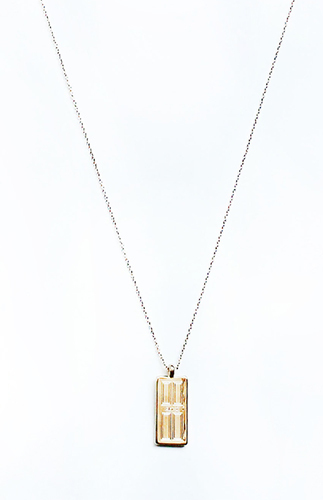 A piece that’s custom with their initial, like this Bare and Me beauty, is something they will wear all the time, and always think of you when they do! We’re giving away beautiful bracelets and earrings for your girls! 4. 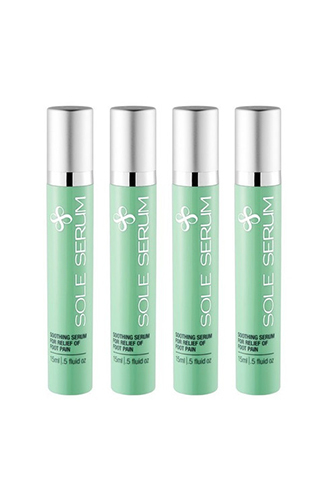 Weddings are a full day affair so save your maid’s feet with Sole Serum! Just roll this fast acting and preventative formula onto the balls and heels of your feet and you will go pain-free for the whole night! 5. How cute are these stemless wine glasses?! Meku Designs offers hand painted glassware that makes for the cutest bridesmaid gifts! 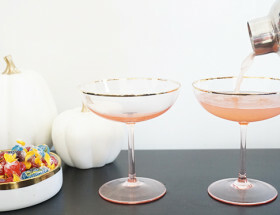 Win these adorable flamingo painted glasses for your bridal party! 6. Now this is a life saver! Outfit your bridesmaids with these Mighty Purse wristlets that charge your smartphone. 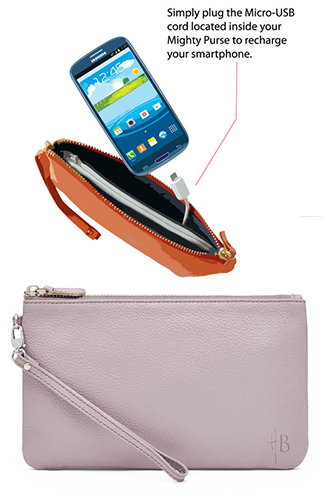 Yes, this purse has the capability to charge your phone – the perfect portable charger turned clutch. Ideal for the wedding day when everyone will be snapping tons of photos! 7. When it comes to custom gifts, laser-cut hangars with each girl’s name engraved are really popular – for a reason! They not only provide a beautiful way to hang everyone’s dresses the morning of, but also make for amazing photographs! Delovely Details offers custom hangars that all maids will love in a variety of styles! 8. This pretty is just for the bride to win! Of course, you can get them for your bridesmaids as well! 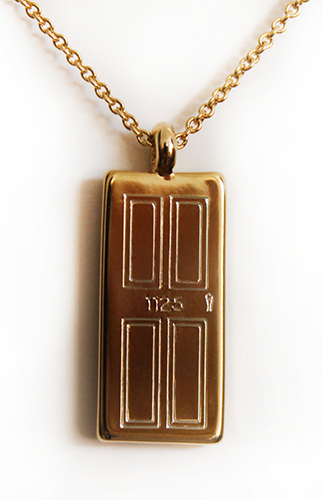 The doorstep necklace from Packed Party is the ultimate momento – pick numbers that are important to you such as the address of you & your groom’s home together, the spot you get married in, or some other special sentiment and wear it around your neck on a super chic mini door! I’m getting married in a few weeks. I’ve been with him almost 10 years and met him in 1992.I’m so happy because I have my first wedding dress fitting tomorrow. I’m the matron of honor in my best friend’s upcoming wedding. She met her fiancé while teaching abroad in Chile. They’re getting married here in California and are serving Chilean wine to commemorate their first toast together. Can’t wait for the festivities! Would love to help her with a few of the expenses by winning us girls some goodies! Thanks for the opportunity! I am getting married in June 2016! 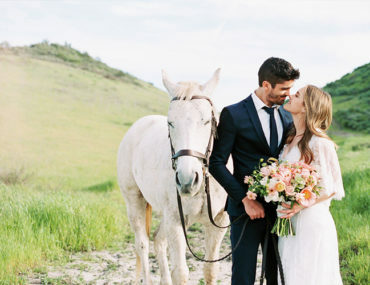 Planning a rustic-chic barn wedding in PA and I’m so excited to have all my friends and family there! My bridesmaids are made up of girlfriends i’ve had throughout my life.. some from Jr. High School, High School, College, and friends i’ve met along the way. Everyone means so much to me – and have been there through it all!! My fiancé and I just got engaged in September in Las Vegas after being together for 6.5 years, and we are just starting to plan our wedding! We are planning a Sunday morning wedding on a golf course with a brunch reception in August of 2017. 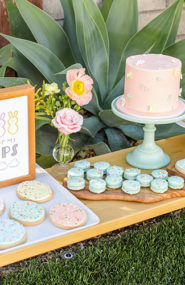 We love brunch and can’t think of a reception that suits our personalities more! Think bacon, eggs, sausages, French toast and waffles! YUM! I am getting married in June 2016! My fiance and I decided on Charleston, SC as a destination of sorts and a good way to incorporate vacation plus a low country wedding for our guests! My fiance and I went to the same high school together but didn’t date until 2 years ago, after our two best friends from high school got married and we started spending time together. We have 8 groomsmen and 8 bridesmaids each in our wedding parties. Almost all of them are friends from high school plus brothers and sisters. We are so excited to have these people up with us by our side on our big day! They truly know us best and have supported us for years and years. My fiancé, Joe and I are getting married on April 9, 2016 in Yukon, Oklahoma at an Oklahoma Landmark, The McGranahan Barn. The look is rustic-chic and lots of Spring colors with gold accents. I would love this giveaway so I can really spoil my bridesmaids. They are the best! I’m the last one in the group to get married, so I’ve been a bridesmaid and maid of honor many times and they’re going above and beyond to make sure that I’m getting the same treatment I showed them. Love that! I am getting married in April 2016 and I know that my bridesmaids would love these gifts! I am lucky enough to have bridesmaids that have been my best friends for 10+ years. I am getting married in July 2016! All of these goodies are so adorable and would be perfect gifts for my lovely bridesmaids. Sister is getting married in November of 2016- would love to win this for HER! Such pretty items! We’re throwing a formal, military, destination wedding in California for our Midwestern family and friends! My fiance will get back from deployment about 100 days before our 7/3/16 wedding. All of my bridesmaids are traveling long distances to come to the wedding so, I’d love to give them something special in return. The little details add up to mean a lot. This wedding is a long time coming for everyone as Erik and I have been best friends for more than 7 years. Everyone else seemed to know we’d get married one day, but it took us a long time to realize life together was perfect. Winning these gifts would be a fantastic way to thank my ‘maids and celebrate this big love Erik and I share in front of the people who mean the most to us. I’m strong married March 26th 2016 in Vegas! However, scratch the image you have in your mind about a Vegas wedding. Ours will be downtown Vegas, but will be as far away from “Vegas” as it can be! We are getting married at the Historic 5th Street School, which is a darling venue with an arorable courtyard and Spanish style. We are going with a very natural, neutral, romantic theme. It’s going to be beautiful! BBQ and Pies are on the menu! We just got our engagement pictures back and they are nothing short of amazing! Cheslea Nicole Photograpy is one of the best, and I can’t wait for her to shoot our wedding, and hopefully details such as these fun bridesmaids gifts!!! We will be getting married on the West Shore of Lake Tahoe in California, August 20, 2016! Lake Tahoe is a place my family and I cherish, I grew up going in the summer for the lake and in the winter to ski! My fiance and I currently live in Colorado, so it was important to have the mountain element as well as the lake! We are getting married at a beautiful home on the lake! This is a destination wedding for everyone! Our guests will be traveling from all over the United States; Southern California, Texas, Illinois, Colorado, Virginia, Wyoming you name it! We are very excited to share the beauty of the lake with our family and friends! We will be organizing a beach day, hikes, and a golf tournament for all of our guests! My bridesmaid introduced my fiance and I, and I am forever grateful! I would love to have some really special gifts to show my love and appreciation for my girls! I’m getting married on December 5th of this year! (2015) & would love to give my bridesmaids a little gift they can keep forever. I’m having my wedding in south Florida in this little old town called Davie. The theme for the wedding is rustic! I can’t wait to say “I do” to my high school sweetheart & share this special day with everyone that we love!! I’m getting married December 12th in downtown Los Angeles. My bridesmaids would absolutely love these gorgeous gifts! My fiance, Jesse, and I are getting married in February. I am having the hardest time figuring out what to get my bridesmaids as a thank you gift. This post was very helpful! They are gorgeous and those hangers would photograph so well. Looking forward to a day on Lake Michigan in Chicago at the South Shore Cultural Center, a 1920’s venue with room for all of our friends and family to enjoy! I love all of these gifts! I am getting married next July and I love those hangers. 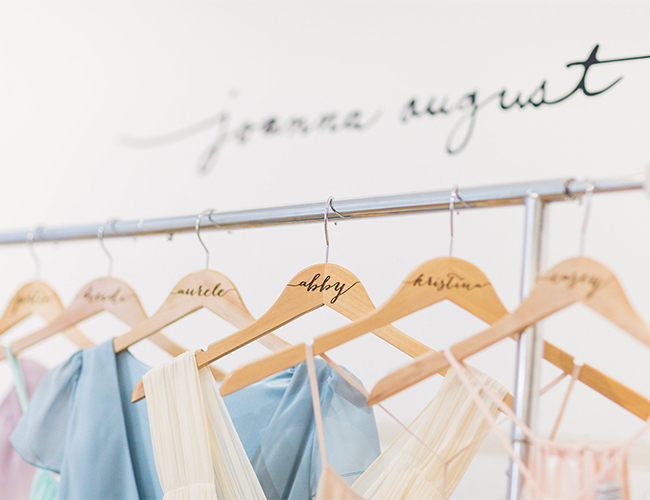 My bridesmaids will be wearing Joanna August dresses and would photograph so well with the hangers! Love these gifts!! Super cute! I’m getting married next June- my fiancé and I met in elementary school, dated all throughout high school and college.. Separated for a few years to discover ourselves as independents and reconnected last January. We were engaged in November and feel like the time spent apart was important to developing ourselves as individuals and realizing what we wanted in a relationship. Not to get sappy, but that’s our story! Would love to give these amazing gifts to the girls who watched us both grow throughout our whole journey (my sister, my best friend, and his two sisters-in-law) who are in our wedding party. I’m getting married next October, exactly one year from today in fact! The only thing better then the amazing fall colors while marrying the man of your dreams, having the important ladies in your life next to you. My moh is my daughter and she wants the full moh treatment! This would be great for the ladies…and myself! ??? Ah my bridesmaids would love all of this! Ok, that Mighty Purse is genius! My finace and I have been dating for almost 9 years, engaged for over 1 year, and will finally be getting married in February! 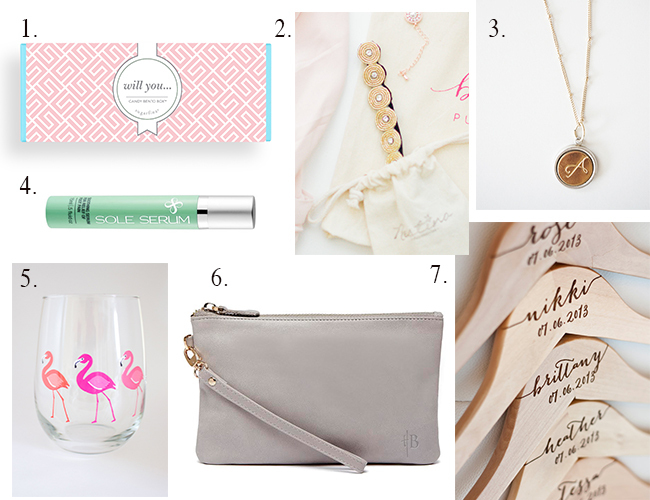 My bridesmaids have been so amazingly supportive so far…these items would be the perfect way to tell them thank you! I am marrying the love of my life in September of 2017! We got engaged in July and have totally loved being engaged and planning the next big step in our lives. We have a venue booked but are happy to take our time planning our wedding day. Soon I will be thinking of how to ask my beautiful sister and two friends to stand beside us on our wedding day! These would make great asking gifts!! My best friend just got engaged, no wedding date yet though. we’re getting married Sept 2016 in philadelphia, the city in which we met and fell in love. many of our closest friends have moved to other major metro areas, so we’re so excited to bring them back together to celebrate this day with us! My bridesmaids would love this! I’m getting married in May 2016 and have 13 bridesmaids! They would LOVE these amazing products! These are amazing! I would love to win these for my 4 bridesmaids – My sister, childhood friend, college friend, and cousin. Wedding is in April 2016, 6 months away! Everything in this is amazing! I’m getting married in May and have the best bridesmaids (from elementary, high school, college, grad school, dodgeball and kickball)! 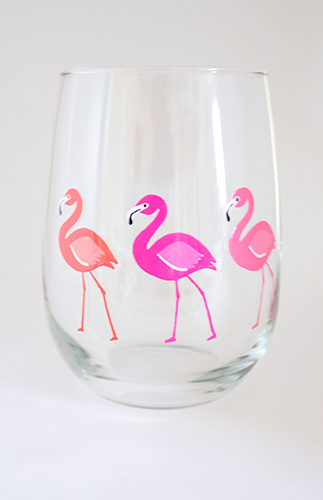 I also am doing a flamingo themed bachelorette in Palm Springs to the wine glasses would be perfect! These are great! I’m going to tell my fiancé about this! I have the BEST bridesmaids. My sister, best friend and soon to be sister in law are the women of strength in my life. I lost my mother and these women have gone above and beyond in every single way to make my engagement as special as possible. I met my fiance right after highschool, but living in separate states, we just maintained a friendship. A few years ago, we decided to give it a shot and now we are getting married in the spring!!! I would love a giveaway like this to be able to thank and show the women in my life how much they truly mean to me!!! This would be perfect!! I just booked a venue this week and haven’t asked my bridesmaids the big question yet. 🙂 They know it’s coming but I’ve been trying to figure out the best way to ask and this would be great! I want a special way to honor the bridesmaids that will be standing with me after all they’ve helped me through with the years they deserve a little showering of goodies. We will be having a wedding on our families property celebrating our love for wisconsin and door county in Door County. Can’t wait to show everyone what we’ve been talking about for years. With a lavender themed may wedding approaching these would be wonderful things to share with my fellow bridesmaids and bride! ahhh wow-an amazing price!!! 🙂 Perfect gifts for some of the most important ladies in my life!!! 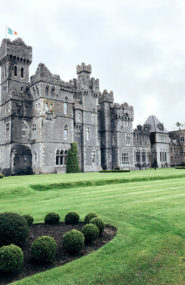 My fiancé James and I are getting married in Denmark (we’re from Ireland) in September 2016 – if the weather is good on the day the ceremony will be on the beach, otherwise in the local city hall, with the reception/shindig, plus all other wedding madness 😉 , taking place at a beach house we’re renting for a week! Love these gorgeous bridesmaid gifts! I can’t wait for my May Marine Corps wedding this coming year! I’m sticking to an outdoor garden/rustic feel with coral, seamist, gold and white decor. The day is going to be so special for us! I’m getting married in May on a farm in PA. My bridesmaid are my girlfriends from highschool and my 2 younger cousins are my junior bridesmaid. Our wedding is coming up in June and we couldn’t be more excited! We can’t wait to share our love and our day with our family and friends! Our wedding is in September of 2016 with a rustic romance theme. I would love to be able to give back to bridesmaid for all the love and support they have given me! It will be next year in September and we have it booked in Mexico! Getting married next year in a beautiful garden in California. We’re in the middle of planning and it’s been great so far. Can’t wait for the big day! Pink and turquoise all the way ? Marrying my high school sweetheart in almost exactly one year and we are so ready to party! The countdown is on to our special day, it would be an amazing opportunity to give a special gift back to the girls who have supported me every step of the way! We’ve have secured a brewery in Western Australia and envisage the day to be industrial chić. Close family and friends will be there as it will be an intimate wedding but we plan on making it there best day of the rest of our lives. I’m getting married to my fiance next fall, 1 year to the day from when he proposed. We’ve always loved the Fall; We met, got engaged, and will now get married in the most beautiful and colorful season! Our wedding is July 10, 2016 in beautiful Hawaii. We are lucky to live in such a beautiful state, but the cost for everything is higher. To be able gift such great items would be amazing!! I JUST got engaged 3 days ago!! This would be so great because I haven’t asked my bridesmaids yet and this package would truly be perfect. Thanks for all the great ideas!! My wedding is May 28– our 6 year anniversary! It’s a small backyard wedding, and I’m so excited to celebrate our time spent together so far and the many many years ahead of us! I’m also so excited to have my best friends by my side when I say “I do!” This giveaway is the sweetest thing! Awesome giveaway! I love everything!!! My wedding is in March, and we’re going to be surrounded by our closest friends and family. It’s going to be such a perfect day, and I’d love to shower my friends with these amazing gifts! Great giveaway with unique gifts for all, thank you! My wedding is in October 2016 in a small town in between Albuquerque and Santa Fe, New Mexico. 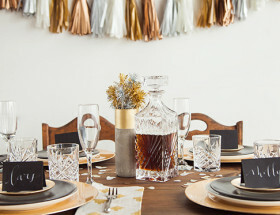 We will have lots of fall decor with copper accents. We want to stay true to New Mexican culture and will have our wedding at a 200 year old adobe hacienda and serve red and green chile! I would love to shower my bridesmaids with some amazing swag! Our June wedding is upstate NY in a one of a kind venue, FEAST at Roundhill. We waited 9 years for this day to come! My wedding is next summer 30 of us on the beach at the cottage where I grew up! I can’t wait! July 2016! Hope I win!! my wedding is in Costa Rica and I have 10 bridesmaids!! So excited!! Our San Diego wedding is 9/16/16 in the garden of The Handlery Hotel. My fiancée was my high school crush! We reconnected 10 years after graduation and fell in love. Our wedding theme is dark romance and has an Alice in Wonderland feel with unexpected, untraditional elements to the celebration. Hi all! I’m getting married next June in Breckenridge, CO on the mountain side near the exact spot that my fiancé proposed last year. The wedding is almost 6 years in the making and I cannot wait to marry my best friend. We’re going for the laid back rustic type feel with navy, blush, and rose gold being our main color palette. I just want everyone to enjoy themselves and enjoy the beautiful scenery that Colorado summers have to offer. I’m lucky enough to get to stand next to my beautiful baby sister as my MOH & 7 of my very best friends, most who I’ve known since middle school, & they would absolutely adore every single one of these gifts. I can just see the excitement on their faces already! My twin sister is getting married in june next year and this would be such a lovely surprise for all the bridesmaids. We very nearly lost her in a serious car crash I’m august this year. She’s just started to walk again and is determined to walk it down the Isle! Winning this prize would just make the day. Thank you ? These are awesome! My wedding is March 4 in San clemente, CA. Haven’t even started looking at bridesmaid gifts. Trying to pull off a 6 month engagement. Can’t wait!!! Wow what gorgeous gifts! I am so lucky to have my girls and they would be so lucky to win these lovely treasures! My wedding is in August in Dallas, Texas! Being a wedding planner, I have seen the good, the bad, and the ugly when it comes to how brides treat their bridesmaids. My goal is to have my most favorite girls feel SO loved and appreciated- becuase they are!!! They are already putting such thoughtful effort into helping me with the planning, taking time off for a bachelorette, etc, so I want to return all the love ten fold! This would mean the world to me to be able to make the girls feel extra special and appreciated!!! Getting married June 24, 2016 at Mile High Station in Denver, CO! I have an awesome bridal party including my 3 sisters and 5 close friends 🙂 the bigger the better, right?! I’ll be apart of my girls big day Sept 17, 2016 in San Clemente! These gifts are amazing and we’d love to win! I’m getting married New Years Day and am in the thick of wedding planning (we’re only having a 3 month engagement.. Yikes!) These gifts are so lovely and it would be so nice to give my girls something special! Fingers crossed! I’m getting married on 12/12 in Georgia. I have ten bridesmaids, and am pooped! No one told me how exhausting this would be! My day is 4/16/2016 and I am SO incredibly excited! I’m trying on my wedding dress for the first time this weekend! I have 8 bridesmaids who range from my first friend (we met when we were 2), to girls I met while at law school. I made sure to surround myself with girls that will lift me up and support my fiancé and myself from now until eternity. My wedding centers around gold and greenery (so many garlands and loose bouquets) while the feeling is southern elegance. It would mean the world if I could give my girls something extra special from here! My name is Amanda and my big day is October 15, 2016! (Which is also my fiancé’s birthday) I have 10 (yes, 10) bridesmaids- 5 are my cousins, 2 are his sisters, and 3 are my best friends! Family first! My colors are soft pink and Forrest green and I have a rustic/romantic vibe. These gifts would be perfect for them and would really show them how much I love and appreciate them being by my side for the best day of my life!! Getting married to the worlds most incredible man 61816. Rose gold, copper, natural wood accents. A cheese board to die for, and a gourmet food truck. Family and dear friends to witness our love. My two best girlfriends from age 4 will be by my side every step of the way. My longest and closest friend (who is obviously my maid of honor) is moving 15 hours away from me to AUSTRALIA in just a few months! We joke about all the cute Aussie boys she will meet and text back and forth using whatever Australian “lingo” Google gives us, but under all the jokes I am having a tough time coming to terms with her being so far away. These bridesmaids gifts would be perfect to not only show her how special her friendship is to me, but also for my other bridesmaids to feel special as well. My wedding is June 18th, 2016 in Virginia at a venue with a stunning view of the Blue Ridge Mountains…please pick me!! These are amazing!!!! I am getting married on 6/4 and have 6 incredible bridesmaids, all from different stages in my life! My sister, soon to be sister in law, very first childhood friend, bestie from elementary school, bestie from HS and bestie from college! My sweet friend Brenda Romero is getting married January 15, 2015. Her and her fiancé are two of my favorite people! They are so full of love it’s so cute and so annoying at the same time. They have promised to not kiss each other until the wedding which makes their big day even more special. Brenda’s two cousins and her three other friends (including myself) are her bridesmaids. Planning the wedding has been a little hectic because of how soon it is and how far apart all of the bridesmaids are but my goodness it is coming up fast ! It would be so amazing to have these great gifts to share with all the girls and bring us together to support Brenda on her big day. I am getting married summer of 2017 and I would love to give these wonderful gifts to my bridesmaids! They all mean so much to me and I couldn’t imagine planning my wedding without them! They totally deserve the best presents to thank them for their place in my wedding and the influence they have on me and my fiancé’ lives! My high school sweetheart and I of nine years will be getting married in exactly 4 months in a small hidden gem located in the beautiful Topanga Canyon. I’ve waited a long time to finally be able to marry my best friend so you can bet I’ve put my blood, sweat and tears into making this the perfect wedding deserving of our love. I have 4 bridesmaids. My maid of honor is my aunt and my best friend. She’s been my other half since the day I was born, and knows me sometimes even better than I know myself. My other 3 bridesmaids have had such an important role in BOTH my fiancé and I’s relationship together, which is what I think choosing your bridal party is all about! These gifts would be such a huge help and a great way to show my girls how much I appreciate them and all of their help. I am having a destination wedding in Croatia with my best friend and sister as my beautiful bridesmaids. This would be the perfect way to thank them for all their help and support, and for coming all the way to Croatia to help celebrate my special day ? I am so excited for my wedding! My fiance and I have been dating for 4 years, but have known each other since we were little. We went to the same grade school, but he’s 3 years older than me, so in school, he was just the boy that played the piano at church, while to him, I was just his soccer coach’s daughter. We are getting married 8/6/16 in our hometown. I have 7 bridesmaids!!! 2 of them are my sisters and the rest are girls who I have been friends with since high school! They are such a great bunch of girls and 3 of them have already been married, so they have been such a great help with planning my own wedding. I don’t know what I would do without all these girls, I’d probably go crazy, cuz having a 300+ guest wedding is insane! My girls are the best and I feel so blessed to have them with me during this wonderful time in my life. The big day is right around the corner on January 10, 2016. As a wedding photographer, I’ve been on the other side of this some 30 odd times and it just can’t be right that I’m the one in white 🙂 We hope that our wedding will be simple, unconventional, and a celebration of our friends and family (not just us!) I’d love to celebrate my girls with these sweet gifts! Hi, my name is Kasey and I’m getting married on December 27, 2015! I’ve been following your Instagram for awhile and I would love to win this prize! I’m 36 years old and I’ve been a bridesmaid in 15 weddings! So I know what being a bridesmaid is all about 🙂 I definitely have put in mine time! My fiancée have been engaged since July 25th and I cannot wait to be married! I’ve found the man of my dreams! We are renting a cabin in the woods for the weekend and out having our closest family and friends join us. If I would win this, it would make for the story of a life time! Never the bride always the bridesmaid wins this beautiful prize!! I will be getting married May 21, 2016 and I have six bridesmaids! I would love to win and share these beautiful gifts with my girls!! Got engaged in August! My bridesmaids would LOVE these! but again, who wouldn’t, they are adorable! Got engaged in August and cant wait to ask my girls to be my bridesmaids! They would love these! 6 months away from our wedding day and I am absolutely overjoyed. I can’t wait to commit my forever to the man that started as my patient at the hospital and is now the love of my life. I am extremely blessed to have 6 wonderful bridesmaids standing next to me on May 7, 2016 and I would love to be able to gift them with these as they absolutely deserve it! This next summer I am getting married to the love of my life! We’ve been together for 3 years now but he finally proposed a week ago. My best friend Mary is going to be my maid of honor, but we haven’t even told her yet, or anyone outside of our families, until we get a date locked down. We’re currently thinking of June 7th but we have to get the date locked down as far as wedding locations go. Anyway, this would be perfect for my bridesmaids when I finally ask them to be a part of the wedding! My daughter is getting married! She and her friends are the cutest things! I would love to win this for her! I’m getting married in a year and a half and would love to have this for my besties! I have a small bridal party, but without the girls in it, I don’t know where I would be! They’ve given me so much love and support and always listen. Besides which, one of them dragged me to the party where I met my husband to be, so I honestly wouldn’t be walking down the aisle if it weren’t for them! My bridesmaids would love this so I hope I win!